Fate Of Irish Giant's Bones Rekindles Debate Over Rights After Death : Shots - Health News Charles Byrne was about 7 feet 7 inches tall, an 18th century marvel whose height came from a pituitary tumor. He asked for privacy in death, but his skeleton is still on display in a London museum. 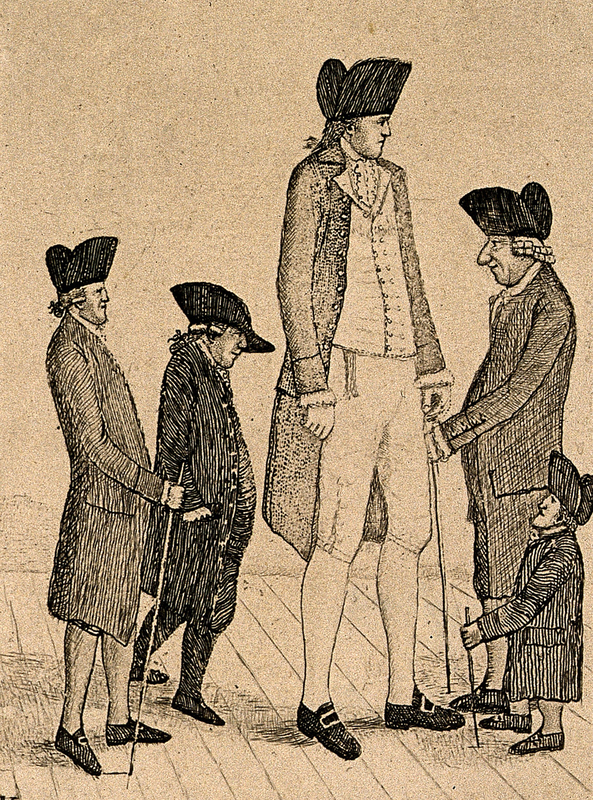 An 18th-century etching by artist John Kay depicts the extra tall Charles Byrne, the extra short George Cranstoun and three contemporaries of more conventional height. Byrne made his living as a professional spectacle and died at age 22 in 1783. His enormous skeleton is on public display today at a London museum, part of a collection of anatomical specimens acquired by the eminent surgeon and scientist Dr. John Hunter, who died in 1793. The bizarre story of how Byrne's skeleton got there dismays medical ethicists. 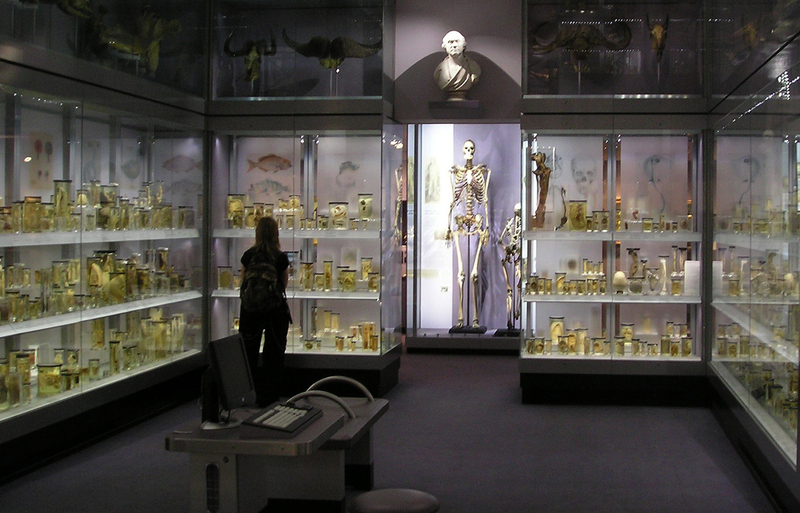 Although the Royal College of Surgeons' Hunterian Museum has resisted calls to give Byrne's remains a dignified burial, some are urging the museum to reconsider the matter this spring, as it shuts down for renovations. The tragic tale of Charles Byrne started in 1761. He was born to a poor family, and grew, and grew, and grew and grew — until he reached the astonishing height of about 7 feet 7 inches. "And this is at a time when the national height average, of course, was much lower than it is now," says Thomas Muinzer, a legal scholar at the University of Stirling in Scotland. He's been fascinated by Byrne's story ever since he was a student and read a legal text that mentioned the Irish Giant in an obscure footnote. "I'm Northern Irish," says Muinzer. "And I'm also tall. Perhaps it resonated with me a bit as a human being." He learned that Byrne made his way to London as a young man, making a living showing off his height. Newspapers of the day called him "the most extraordinary curiosity ever known or ever heard of in history," and he even inspired a hit London stage show. The tumor in his pituitary gland that made him tall, however, also made him sick, and he reportedly drank a lot. At the age of 22, Byrne was on his deathbed, surrounded by friends. And he was scared — but not just of dying. "He had a fear that if he was buried in the ground," says Muinzer, "his body could be snatched by what were then called resurrectionists." He is now, after having being stolen on the way to his funeral, on display permanently as a sort of freak exhibit in the memorial museum to the person who screwed him over. The resurrectionists were the shady grave robbers who sold corpses to medical schools or scientists who needed human bodies to dissect. Byrne knew his remarkable body would be a real prize. So he made this unusual final request: "Charles directed his pals to weigh him down in a kind of lead coffin and bury him at sea," says Muinzer. Only at the bottom of the English Channel would his body be safe from dissection, Byrne thought. "Charles was well aware that the surgical establishment had their eyes on him, if you like, and in all likelihood he was concerned about Hunter specifically," Muinzer says. And with good reason. Hunter was, in fact, hunting the Irish Giant. An unscrupulous undertaker secretly opened Byrne's coffin and switched his dead body for dead weight. The funeral went on, but the huge corpse got spirited away to Hunter's house. The surgeon kept all this under wraps for a few years. But the story eventually came out — as did Byrne's skeleton, which became one of the highlights of Hunter's collection. And incredibly, more than two centuries later, you can go see the bones for free at the museum named after Hunter. "In the sort of center of the ground floor," Muinzer says, "you have this enormous skeleton in an illuminated display case. And that's Charles Byrne." The Hunterian Collections at London's Royal College of Surgeons boasts "unrivaled collections of human and non-human anatomical and pathological specimens." Charles Byrne's skeleton stands prominently, beneath the looming bust of John Hunter. Muinzer has written journal articles calling for Byrne to get his burial at sea. He's not the only one who has been drawn in by the pathos in Byrne's story — the giant has showed up as a character in more than one novel, and there's even a song about him. "Do we want to live in a world where people die, they're gone, who cares about what they wanted in life in terms of the remains or in terms of their burial?" says Muinzer. "Or do we want to live in a world where we respect people's wishes after they've passed away?" Even now, the wishes of the dead and their families aren't always followed, says Jeffrey Kahn, a bioethicist at Johns Hopkins University. "There have been numerous cases in the not so distant past of bodies that were supposed to go to cemeteries ending up in medical school dissection classes," he notes. "That happened in New York state, not so long ago." In this case, Byrne was very clear about what he wanted, Kahn says. "It wasn't to display him in a museum. And I wonder what the value of continuing to display his skeleton actually is. Is there more to be learned?" "The Royal College of Surgeons believes that the value of Charles Byrne's remains, to living and future communities, currently outweighs the benefits of carrying out Byrne's apparent request to dispose of his remains at sea. No will or testament survives — there is no direct evidence of his burial wishes." The museum cited research into familial isolated pituitary adenoma, which recently was done using DNA extracted from Byrne's teeth, as evidence that the remains have value. But critics say such studies could be done on living people with this condition who give consent. And anyway, they note, the bones could be kept for research without having them on display for the public to gawk at. A spokesperson for the museum told NPR via email, "Charles Byrne's remains will remain on display after the redevelopment. This will be kept under review." The DNA research done on Byrne has genetically linked him to living people, "including individuals who have requested that the skeleton should remain on display in the museum," according to the spokesperson, who said the museum found their views "significant." But some ethicists question why the views of these individuals should be given any special weight at all, since they are only distantly related to Byrne — their shared common ancestor lived some 1,500 years ago. "It seems perfectly clear to me that it's far more compelling to obey the refusal — and it's undisputed refusal, of the person himself," says Raanan Gillon, an emeritus professor of medical ethics at Imperial College London. One person who has been genetically linked to Byrne is Brendan Holland, another man from Northern Ireland who grew to a height of 6 feet 10 inches before being diagnosed and treated. To Holland, the most important thing now is to screen for the genetic mutations that can give rise to a hormone-producing pituitary tumor. Early diagnosis and treatment often can largely prevent the illnesses that the excess hormones cause in living people. Holland says he doesn't have the scientific or medical expertise to say whether the skeleton can yield up any more helpful information. Personally, says Holland, he wouldn't care if his dead body ended up in a glass case for a couple of hundred years. "I'm one of those people who take the view that when you're dead, you're dead," says Holland. He has been face to face with Byrne's skeleton and isn't sure what should be done with it. "I'm not 100 percent convinced one way or the other," says Holland. "I can see both sides of the argument." Museums are full of human remains that didn't arrive with signed consent forms. The ancient Egyptians probably wouldn't have been thrilled about having their bodies taken to far-off lands and photographed by many generations of tourists. But Muinzer, the legal scholar, says that Byrne's case is unique. "He is now, after having being stolen on the way to his funeral," says Muinzer, "on display permanently as a sort of freak exhibit in the memorial museum to the person who screwed him over, effectively."